Critics say that "fracking" – pumping water and chemicals into the ground to release oil and gas – is a risky business that can cause water contamination. But cash-strapped cities like Youngstown, Ohio, are contemplating selling mineral rights to allow energy companies to drill and frack. NBC's Phil LeBeau reports. An Open Channel post last week from the Food & Environment Reporting Network drew the attention of Steve Everley, a spokesman for Energy In Depth, a research and public education program of the Independent Petroleum Association of America. Here is his rebuttal to the article, which appeared in a longer form in The Nation. A recent article in The Nation magazine, in collaboration with the Food & Environment Reporting Network (FERN), made a series of declarations and assertions about the impacts of hydraulic fracturing, specifically with respect to agriculture and America’s food supplies. It was a frightening tale, but the facts that were left out were just as notable (if not more so) than what was selectively chosen to be included. From there, the story advances as one would imagine. Using the fatally flawed Bamberger-Oswald “study” on hydraulic fracturing as the focal point, the author weaves a carefully constructed narrative that does everything from repeating common (and debunked) activist talking points to claiming America’s cows are being poisoned to death by oil and natural gas development. Of course, the story would have been much different had the author included (instead of deliberately omitting) scientific assessments that weren’t tailor-made for an anti-natural gas crowd. How do we know they were deliberately omitted? Well, to her credit, Elizabeth Royte (the author of the piece) reached out to Energy In Depth several weeks ago about this article. She acknowledged having read EID’s work on the subject, and then asked me some pointed (but fair) questions about potential impacts on livestock and crops from hydraulic fracturing. I sent her a detailed response, including links to studies (more on that below) that demonstrate little if any negative impact on health as a result of nearby shale development. I also emphasized that concerns about public health should always be taken seriously, and the industry naturally does exactly that. But I also cautioned that simply blaming impacts on the most convenient thing (i.e. hydraulic fracturing) without scientific evidence does not solve problems, nor does it encourage the proper kind of public dialogue to address concerns. Unfortunately, Ms. Royte did not see fit to print any of that, choosing only to include a brief mention of the lack of scientific pedigree in the Bamberger-Oswald paper – which was promptly bracketed by ascribing fault to the natural gas industry for a supposed lack of disclosure. So, what else didn’t make it into the report? 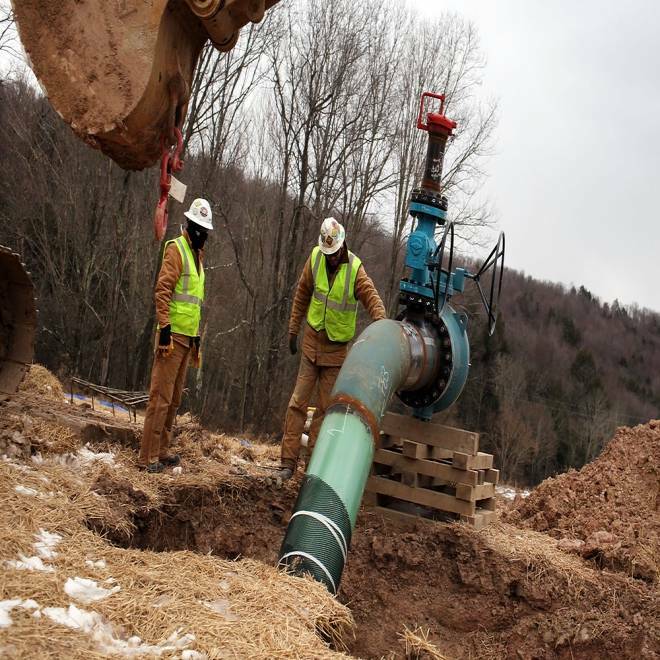 Cabot Oil and Gas workers examine a natural gas valve at a hydraulic fracturing site in South Montrose, Penn. I shared all of this information with Ms. Royte, but Dr. Rae’s commentary on the Bamberger-Oswald paper was omitted entirely from the story. Denton County, Texas: An analysis by two public health experts found that, “even as natural gas development expanded significantly in the area over the past several years, key indicators of health improved across every major category during those times.” Denton County is situated atop the massive Barnett Shale, one of the largest natural gas fields in the United States. Fort Worth, Texas: An air quality study conducted for the City of Fort Worth – the largest and most comprehensive of its kind to date – determined there were “no significant health risks” from shale development in the area. Fort Worth, located in Tarrant County, also sits atop the Barnett Shale. There are, of course, many more examples, including hard data from the Bureau of Labor Statistics that undermine the suggestion that hydraulic fracturing is a grave threat to occupational or community health. Most of us also know about the AP investigation earlier this year, which found that activists’ claims about hydraulic fracturing causing cancer and other health problems had little or no basis in fact, much less scientific evidence. So again, why were these examples omitted from the report? It’s really anyone’s guess. The one common denominator, however, is that none of them conforms to the notion that hydraulic fracturing is somehow a “tornado on the horizon” – as Sandra Steingraber, the lead-in voice to the Bamberger-Oswald paper, once put it. In fact, a sober review of these materials – and a proper weighting of the credibility of those who released the information – might even lead people to realize that claims about impending doom are hyperbolic and, in many cases, flat out untrue. Here’s the bottom line: Landowners, farmers, and any other individuals can and should ask questions about the impacts of natural gas development. Those who ask questions should demand answers based on facts, and communities weighing the costs and benefits should, by definition, seek input on both sides and make decisions based on a careful review of that information. The problem with Ms. Royte’s report, though, is that it did not seek to be a part of that good faith dialogue. By relying on anecdotes and a single, fundamentally flawed research paper – and refusing to even discuss findings that contradict the singular message that those sources conveyed – the story that was presented to readers was not only one-sided, but actually harmful to the broader public discussion about developing oil and natural gas from shale. Despite that, the story has been reprinted in news outlets and other media as if it carefully weighed competing viewpoints and came to a frightening conclusion. But the truly scary part is that the author, in more than 4,000 words, flat out refused to include even a few sentences about the scientific findings that fell outside what was apparently a pre-determined conclusion. Maybe the next investigative report will examine the reasoning behind such a glaring omission, though we won’t be holding our breath. Click here to read Food & Environment Reporting Network's Elizabeth Royte response.